40TH ANNIVERSARY OF NIXON’S RESIGNATION « THE BRYCE IS RIGHT! – Did Watergate teach us anything? August 9th represents the 40th anniversary of the resignation of President Richard Nixon. It seems like yesterday. 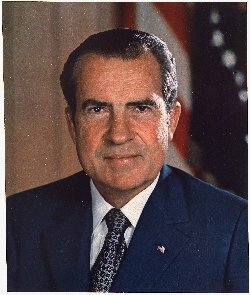 Nixon was under intense pressure to resign for his involvement in the Watergate scandal. For those of you too young to remember, 1972 was a presidential election year and members of the Committee for the Re-Election of the President (CRP) burglarized the Democratic National Committee’s headquarters at the Watergate Complex in Washington, D.C. with the intent of searching through papers for intelligence and bugging the offices with listening devices. A security guard noticed something unusual and called the police who captured the burglars. Nixon’s role was primarily concerned with the cover up of the break-in. The incident attracted international attention from the press and the country wallowed in outrage and despair for two years. Former Sen. Howard Baker of Tennessee, who just recently passed away, succinctly framed the issue at hand by asking, “What did the president know and when did he know it?” This brought up the subject of tape recordings of conversations in Nixon’s White House. The president made the recordings for historical purposes, but now they became the center of attention for what they might contain. At first, the president invoked “executive privilege” over the tapes, but the US Supreme Court overruled and ordered him to turn the tapes over to government investigators. The tapes ultimately revealed the president’s involvement in the cover-up. However, there was a gap in one of the tapes. Rose Mary Woods, Nixon’s long-time secretary, claimed responsibility for inadvertently erasing up to five minutes in a key audio tape (June 20, 1972). At the time, both chambers of Congress were controlled by the Democrats. As it became obvious the House was going to file articles of impeachment based on obstruction of justice, the president received a delegation of senior GOP Congressional leaders in the Oval Office on August 7th, including Senator Barry Goldwater. The group told the president his position was untenable and impeachment was likely. Instead of prolonging the problem, and putting the country through a messy impeachment trial, Nixon resigned, thereby elevating Gerald Ford to president. First, Richard Nixon resigned as opposed to burdening the country with more scandal. Bill Clinton did not. Clinton’s scandal was just as messy and embarrassing, maybe more so. Nonetheless, he suffered the embarrassment of impeachment, but escaped prosecution in the Senate trial. American politics hasn’t been quite the same since then. Second, Rose Mary Wood was accused of deleting five minutes from Nixon’s Watergate tapes which was considered alarming at the time and proof of Nixon’s involvement in the cover-up. Recently, IRS Commissioner John Koskinen revealed two years worth of e-mails of former IRS Director Lois Lerner and six others were lost allegedly due to malfunctioning computer backup equipment. Lerner was key to the IRS scandal which targeted Tea Party groups for auditing by the IRS. The deletion of the e-mails was considered too “coincidental” for Congressional investigators. Suddenly, Wood’s five minute gap seems miniscule when compared to the loss of thousands of e-mails. Finally, when I traveled overseas on business years ago, I had several clients ask me about Nixon and Watergate. They thought Nixon was a good president and were stunned we had turned him out for something they considered trivial and insignificant. Whether I was in the UK, Norway, Spain, Brazil, Japan or wherever, they all thought Nixon should have taken the tapes and burned them on the White House lawn. I wonder what their take would be today on such things as the IRS and VA scandals, Benghazi, Fast & Furious, etc. Knowing their unfavorable disposition about Mr. Obama, I believe I know what their answer would be. NEXT UP: THE WHITE LINE – What does this parable tell us about ourselves? This entry was posted on July 30, 2014 at 6:00 am	and is filed under Politics. Tagged: 40TH ANNIVERSARY OF NIXON'S RESIGNATION, Florida, palm harbor, The Bryce is Right, tim bryce. You can follow any responses to this entry through the RSS 2.0 feed. You can leave a response, or trackback from your own site.